Crimean Forum, Soviet dissidents will continue to defend human rights in the former USSR. Prominent Soviet-era dissidents have founded the Crimean Forum, an annual meeting of political prisoners of the Communist regime and human rights activists, whose purpose is to ensure the consistency of the human rights movement of the former USSR in the work of civil society institutions in the former Soviet republics. The forum was founded at a working meeting of prominent dissidents and fighters for human rights in the USSR, who had gathered together to remember of the victims of the genocide of the Crimean Tatars (the May 18, 1944 deportation), the Crimean Tatars’ Mejlis reported. The meeting participants adopted a statement on the foundation of the Crimean Forum, stating that cardinal changes have occurred in the political and economic life of independent states since the collapse of the world Communist system over 20 years ago. “However, no matter how different these changes may be, the situation with civil rights and freedoms in some former Communist states deserves close attention and often needs an immediate reaction from international institutions and human rights organizations. In countries such as the republics of Central Asia, Armenia, Belarus, Russia, and Ukraine, democratic processes are being stopped rapidly and political opposition and civil activists are being persecuted,” the statement says. “Wishing to ensure the continuity of the human rights movement of the former USSR in the work of civil society institutions in the former Soviet states, we announce the foundation of the Crimean Forum, an annual meeting of political prisoners of the Communist regime and human rights activists in Crimea,” the statement says. 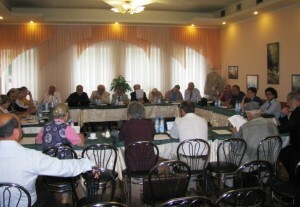 The meeting participants has tasked a working group with developing and discussing with all political prisoners of the Communist regime and human rights activists who share the idea of the foundation of the Crimean Forum organizational documents determining the composition of the forum, the procedures and time of its conviction, the formation of the agenda, and the decision-making process by September 1, 2012. В работе совещания участвовали АЛЕКСЕЕВА Людмила (Россия, Москва), АРУТУНЯН Вардан (Армения, Ереван), БУКОВСКИЙ Владимир (Великобритания, Кембридж), ГОРБАНЕВСКАЯ Наталья (Франция, Париж), ГРИГОРЕНКО Андрей (США, Нью-Йорк), ДЖЕМИЛЕВ Мустафа (Украина, Бахчисарай), ЗИСЕЛЬС Иосиф (Украина, Киев), КАЛАБУГИН Валерий (Эстония, Таллинн), КОВАЛЕВ Сергей (Россия, Москва), ЛАВУТ Александр (Россия, Москва), МАРИНОВИЧ Мирослав (Украина, Львов), ОВСИЕНКО Василий (Украина, Киев), ПОДРАБИНЕК Александр (Россия, Москва), РЕДДАВЕЙ Петер (США, Вашингтон), СВЕРСТЮК Евгений (Украина, Киев), СЕЙТМУРАТОВА Айше (Украина, Симферополь), СМИРНОВ Алексей (Россия, Москва), ХАИРОВ Изет (Украина, Симферополь), ХЛЕБОВИЧ Петр (Польша, Краков), ШЕВЧЕНКО Олесь (Украина, Киев), ЯНКЕЛЕВИЧ Татьяна (США, Бостон).